Population: 200.4 MillionLocation: South AmericaMain surf area: All along the Atlantic coast!Language: Portuguese Currency: Brazilian RealYear round surf: Yes! Most consistent surf The North between Nov – March (Summer). The South between April – Sept (Winter). Best time for Beginners: Year Round! 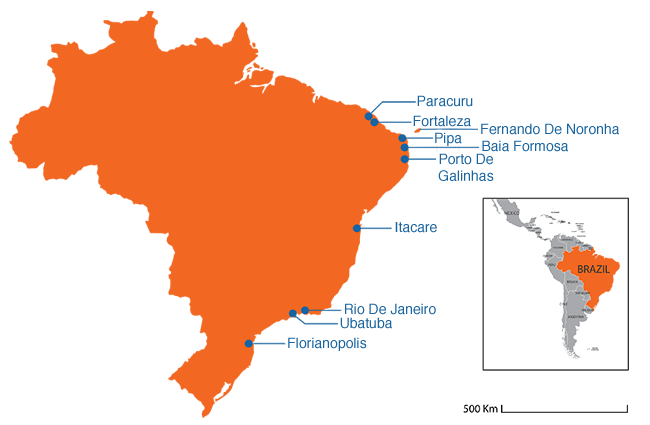 Brazil's boarders carve out a huge tract of the South American continent, being by far the largest country in the region. Brazil is a huge land mass, with a ruggedly tropical 17,491KM coastline which plays host to countless surf breaks of all descriptions making it no wonder that the country has delivered some of the world’s top ranking contemporary surfers. Surfing was first seen in the country as early as 1928, and was taken up by locals throughout the thirties as Brazilians began to shape and ride their own boards in Rio de Janeiro. The evolution of surfing was influenced by the arrival of Ozzie surfer Peter Troy in the sixties, and in 1965 the countries first surf federation was established. The 70’s brought about a new age of surfing in Brazil, with an explosion of interest in the sport from the local population, with the first national championships being held at Ubatuba in 1972. An increasing presence on the world pro circuit throughout the 70’s and 80’s firmly marked Brazil as a heavyweight of international surfing. More recently, names like Toledo and Medina have carried the mantle of Brazilian infamy on the pro circuit. Maya Gabeira is also a notable big wave surfer from Rio de Janeiro. Out of the water, Brazil’s incredibly diverse landscape has more than enough to keep you captivated. Covering a massive 8.516,000,000 KM squared, this incredible land mass can accommodate every speed of traveler. Whether partying in Rio, exploring the Amazon Rainforest or finding stillness on your own stretch of untouched beach, Brazil has something to capture every imagination. The Portuguese speaking nation of South America, Brazil has its roots in Western and indigenous cultures. This diverse cultural background has bloomed in to a nation that moves to Samba year round, the famous Carnival in Rio, and invites you to join the celebration at every turn. What´s the Surf like in Brazil? Considering the size of the Brazilian coastline, you can imagine that the amount and diversity of surfbreaks in Brazil is monumental. Although the country is known mostly for its beach breaks, you will be sure to find all sorts of spots such as reef breaks, point breaks, slabs, you name it. With some time on your side to explore, you can find lots of uncrowded gems. From North to South you can notice big cultural and regional differences, but they all share the same passion for surfing in Brazil and their local waves. Located on the Northeast region of Brazil, the state of Ceará is one of the main surfwear industry centers in the country, with many local brands that have developed together with the strong textile sector in the region. These local brands have been sponsoring local talents for years, making Ceará a breeding ground for professional surfers. The countless breaks of the region also provide plenty of waves for the development of these new talents. The area´s best season is between November and March when swells from the North Atlantic come sweeping down and clashing with this state´s north facing coastline, making all the breaks in the area pump big time. The state´s capital Fortaleza is a dynamic surf city with boardshops in every corner and a big variety of surf spots. The most famous one´s are Praia do Futuro and Titanzinho, which is probably the best wave in the city but with very territorial locals. The outskirts of Fortaleza is also famous for the enormous sand dunes. Riding the dunes on a buggy car or sandboard is guaranteed fun. A short drive further north you can find Paracuru, one the best right point-breaks in the region that is definitely worth the go. It´s a small beach side village, with plenty of unspoilt beaches to discover. Other surf towns include Taiba and Jericoacoara. For On the other months of the year there is still consistent surf throughout the area, but the wind picks up making Ceará a kiteboarder´s dream with their strong and consistent winds. Kindly nicknamed "Brazilian Hawaii", this small chain of islands sits just over 360 Km for the coast of Brazil, and is home to some of the best and biggest waves in the country, apart from being a breathtaking place. Also exposed to North swells between November and March, on the big days Noronha can deliver 15 foot+ waves. The infamous beach Cacimba do Padre, which has been stage to a Prime WSL event for over a decade, is best known for its hollow and perfect barrels. Within walking distance you can also find pristine barrels at Praia do Bode, and Boldró beach which has an outside reef that is called the Pipeline, when it breaks. Since it´s an island, everything costs more over there, which makes it a pretty pricey destination, but hands down one of the top surfing places to visit in the country. In addition to that, Noronha is also a protected marine national park making the place perfect for diving in clear blue water amongst dolphins, turtles, sharks and a myriad of marine species. Noronha is just a short flight away from the cities of Recife and Natal. This state is fortunate enough to be on the most northeasterly point in Brazil, making the area exposed to both northerly and southerly swells. That means consistent surf year round. The beautiful town of Pipa, with it´s beach surrounded by amazing cliffs, and 3 great right point-breaks that work best with a north swell, but also happen on south-easterly swells. There´s a couple beach breaks in the area that are also worth the check. Pipa is also a gourmet destination with fabulous restaurants and cafés on offer. The Dolphin Bay in Pipa is visited every morning by packs of dolphins. Get there early and have an amazing experience swimming with these guys. Pipa is a great spot to spend some time surfing and chilling out at a Brazil Surf Camp. About an hour´s drive south of Pipa is the fishing village Baía Formosa. Home to probably the best right point-break in the whole Northeaster region and one of the best in the country. The spot is the home break of the top ranked WSL surfer Italo Ferreira. On the best easterly swells the waves come peeling down the point with long rides all across the bay. With the media exposure of the spot, it has become pretty crowded. But on weekdays you can score with few locals in the water. The closest airport for the area is the capital city of Natal. It´s got a laid back atmosphere remaining primarily a fisherman´s village in its essence. One of the most traditional surfing epicenters in the country, Pernambuco main capital city Recife is no longer so great for surf due to the ocean pollution. Although just an hour´s drive south you´ll reach Porto de Galinhas, a beautiful beach town with plenty of breaks worth checking. Cupe and Maracaípe bay are probably the best known spots in the area. About a couple kilometers from each others, both of the are fun beach breaks that, on an offshore day, with south-easterly swell and a good sand bar, can deliver perfect fun waves. But both are very consistent on the average day, with very few flat days throughout the year. Make friends with a local in this area and he might tell you a secret or two about hidden perfect reef breaks in the vicinity. The main beach at Porto de Galinhas is surrounded by a huge barrier reef that forms many small lagoons with crystal clear water and plenty of marine life, a true paradise that has been many times elected as the most beautiful beach in Brazil. Back to Recife, it is a vibrant city with lots culture to offer and a great night life. Just north of Recife there´s the historic city of Olinda with its colonial time churches and streets that have an amazing artsy and laid back atmosphere. Just recently coming into the spotlight as a surfing and tourism destination, Itacaré still remains a kind of alternative place to visit for a surfing holiday. It´s visitors usually come for the eco-tourism focus of the area since it´s a region covered in dense forests with great beaches and waves on offer. There´s plenty of tracks for hiking through the woods which give access to the beaches and to the several waterfalls in the vicinity. There are countless breaks in the area but the best known ones are Tiririca, Jeribucaçu and Engenhoca. The first two with better waves for experienced surfers, and the latter great for beginners on smaller days. The best thing is that most beaches are only accessible by foot through the woods, which gives a pretty untouched vibe to the beaches. The town centre is pretty laid back, not yet invaded by the crowds, with pretty much a single small promenade that concentrate most cafés, shops and restaurants. Just a few miles from the centre there´s also river rafting in Taboquinhas which is guaranteed fun. Brazil´s largest surfcity and international post card is a must go whatever your interests are. And if it´s surfing you´re interested in, there´s lots spots to enjoy. Even though there´s surf of the world famous Copacabana and Ipanema beaches on the south side, it´s the beaches on the west side where you will find the best waves and a more laid back atmosphere. The Recreio and Macumba beaches have beautiful waves for all levels, but are still surround by urban life. If you drive just a few more minutes down the coast, you´ll get to Prainha beach, which is totally surround by rainforest. An absolute beauty, and with great waves, and beach side huts with amazing food. In Rio your options are endless regarding sightseeing and culture. There´s always good samba music playing in the bars downtown, and the Christ Redeemer Statue is always open with the best view of the “Cidade Maravilhosa” (Marvellous City) as Rio is known. This surf region on the Northern side of the State of São Paulo is probably one of the best swell magnets in the whole country. Ubatuba has about 80 beaches in its area, varying from little coves, point breaks and open sea beachbreaks. Nestled in and tropical rain forest region, most beaches in Ubatuba mix that sandy beach landscape with dense tropical vegetation. The most coveted wave in the area is Itamambuca, with a great right peeling down from the point, but there's plenty of sand bars all along this long beach where you can certainly find a less crowded spot. Ubatuba is also known for it´s many waterfalls. Try and visit Prumirim beach, where there´s an amazing waterfall and small lake for a quick swim. The beach at Prumirim is also great for a Stand Up Paddle ride when the waters are calm. It´s great fun paddling around the large island-rocks off the coast of this beautiful beach. In the last couple decades, Florianopolis, in the state of Santa Catarina, has become the most important surfing center in Brazil. The largest and most famous surfboard factories and brands are headquartered in this city, mostly for its amazing and consistent waves all year round. Connected to the continent by a bridge, this island-city has surfspots on every direction and for all levels of surfing in Brazil. The city breathes the surf culture, and surf tourism is also a great source of income to the area. Right in the middle of the island is the beautiful Conceição Lagoon, which can be seen from almost any spot of the island. Joaquina beach is probably the most famous beach in Florianopolis, which hosted the first major international surfing contest in Brazil back in 1986. Praia Mole is also a great beach for beginners with its rideable beach breaks that can deliver perfect waves on an offshore day. Florianopolis is truly a beach life city that revolves around surfing with a great night life for travelers. Definitely one of the great surf destinations in the country and a really great Brazil surf holiday option. Brazil is a country of continental proportions, which obviously means extreme differences in climate and water temperature. You´ll basically find warm water all year round up north, temperate climate in the south east, and cold water in the extreme south of the country. For the northern part of Brazil it is summer year round! Further South and around Rio the winter months are from June to September, and summer is from December to March. With sunny skies all year round, and not much rain at all, you´ll just need warm water surf wax, boardshorts and sun cream, with temperatures close to 30°C at all times. Be sure to bring a good hat and plenty of sun cream to this tropical island paradise, as you are expected to spend most part of the day outdoors, where there´s no shade and the sun is scorching. Pretty much similar weather as Ceará, this region does get a bit more rain to cool things down a bit once in a while, but never below the tropical weather standards. The year is basically divided between the wet season from May to September, and the dry season from October to April, although it can also get rainy these months as well. Temperatures never go below 25°C on the wet season and can go up to the mid 30°C any given day. Follows the same weather pattern as Pernambuco, except it gets a bit cooler during the wet season, but not enough to ditch the boardshorts. You might use a rashguard the odd morning that may bring a cool seabreeze. Extremely hot summers with temperatures reaching 40°C, and mellow winters averaging 20°C, but with the odd cold front, temperatures can drop to around 10°C. The thing in Rio is that due to a cold water current, even during summer, the water is cool around 18°C, but can drop to around 15/16°C in winter when you will definitely need a full 3/2 wetsuit. Eventhough Ubatuba is further south than Rio, it is not affected by the cold water current that cools down its northern neighbour. Boardshorts should suit you fine through the summer months, but you´ll need a springsuit between seasons, and a full 3/2 suit for the cold winter mornings when water and air temperatures average 16°C. Located on the southernmost region of Brazil "Floripa" has warm summers, pleasant spring and autumn seasons, and pretty chilly winters (June-Sept), when temperatures can drop to around 5°C. Locals will probably choose boardshorts during summer (Dec-March), but play it safe and bring a springsuit in case you feel cold. During winter, the full 3/2 is a no brainer. For a more detailed look at when & where to surf in Brazil for your surf level use our Surf Trip Finder. Then browse each destination to discover the best selection & lowest prices. We have a great choice of accommodation & lessons in Brazil's best surf towns. Book your surf holiday online now!